Zepi: War is a game app. by Viacheslov Luschenko where your purpose is to get rid of different war objects that enter the screen by tapping on all of those objects on the screen that are the same. You are awarded points for tapping the objects and getting rid of them. There are three versions of the game within the app.- Vietnam, Civil War, and WWII. There are four distinct objects within each version of the game. Vietnam has dog tags, grenades, a peace sign, and a green helmet with bullets and a pack of cigarettes in the band around it. The Civil War section has a canteen, a drum, a gold shield, and a blue hat. The WWII section has a purple heart, a bomb that says “fat man” on it, a blue circle with a white star on it, and a green helmet with a red cross on it against a white circle background. So all of these objects come from the sides of the screen and gravitate towards a circle in the center that keeps track of your points. I initially thought that I might be able to move to another level if I got rid of every object on the screen, but I soon found out that this is probably impossible. Every time you get rid of objects, more appear. You can lose the game if the screen becomes saturated with objects and no more can come into the frame, but I think you could play and get points forever as long as you get rid of enough objects. So it seems the objective is to top your own high score, not necessarily to move forward in the game. My favorite part of the game is that you can start a game in one of the war sections and then resume that same game in another. So if you start in Vietnam and want to switch into WWII mode, you can do that without losing the score that you already racked up in Vietnam. Besides having different objects to get rid of, each war section also has different sound FX. Each time you get rid of objects in the Vietnam section, it sounds like a sniper shot. When you tap and hold the middle circle to return to the menu, it’s a bell ding. In the Civil War section, when you tap each object, there’s a drum sound. When you exit to the menu, a horn melody plays. In the WWII section, a grenade pin falls when you get rid of objects, and returning to the menu gives off a large explosion sound. I think the look and feel of the app. is great- and for anyone who is into war games, I’m sure you won’t mind paying the $0.99 to add this one to your collection. It’s just that the actual game play itself is a little too repetitive and simple for my taste. But if you’re into quick-paced matching games, then you’ll love Zepi:War. 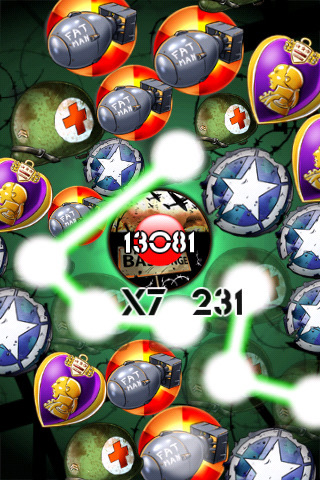 AppSafari review of Zepi:War was written by Tyne Kennedy on May 21st, 2010 and categorized under App Store, Fun, Games, Puzzler. Page viewed 3497 times, 1 so far today. Need help on using these apps? Please read the Help Page.